When high expectations are an everyday demand, rise to the challenge with this professional-quality 11x17 printer. The HP OfficeJet 7740 wireless color printer prints, scans, and copies with standout color up to 11x17 inches (A3), for bold documents and presentations at up to 50% lower cost per page than color lasers. Easily connect your smartphone, tablet, or laptop, and print from anywhere in your office and deliver impressive client presentations and meaningful internal documents. Main functions of this 11x17 printer: copy, scan, fax, wide-format printing up to 11x17 inches, wireless printing, 2-sided duplex printing, color touchscreen, automatic document feeder, and more. Mobile printing capability: Print from your iPhone with AirPrint, send jobs from your devices to any company printer using Google Cloud Print, and print without a network using Wi-Fi Direct printing. 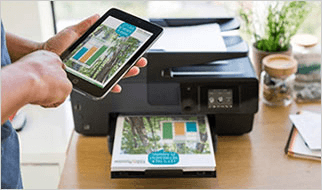 Download the HP Smart app and easily set up this wireless printer, scan documents with your camera, and print from social media or the cloud, such as Google Drive and Dropbox. Put your business's best foot forward with standout, high-quality color prints that cost up to 50% less per page than color lasers. Support high-volume office printing with a paper input capacity of up to 500 sheets with two 250-sheet paper trays. Print, scan, and copy in standout color on a variety of paper sizes from letter to 11x17 inches. 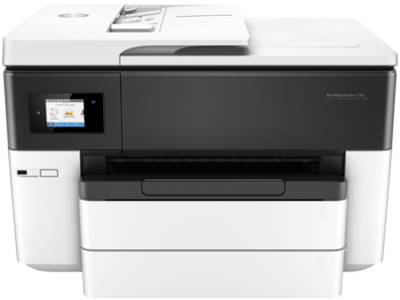 Tap and swipe the 2.65-inch color touchscreen, easily manage print, scan, copy, and fax jobs directly at the printer. Use Original HP 952 & HP 952XL ink cartridges for great result print after print. Original HP ink prints up to 2x the pages as refilled cartridges. What's in the box: HP OfficeJet Pro 7740 Wide Format All-in-One Printer, HP 952 Setup Black OfficeJet Ink Cartridge (~1000 pages), HP 952 Setup CMY OfficeJet Ink Cartridge (~625 pages), Power cord, Phone Cord, CD-ROM, Setup poster, Getting started guide. Print, scan, and copy in standout color on sizes up to 11 x 17 inches (A3), for bold documents and presentations at up to 50% less cost per page than color laser.1 Fax up to 8.5 x 14 inches (21.6 x 35.6 cm). Set up without a fuss—automatically connect to your wireless network. bl7262: HP does not support any of their legacy devices. Terrible. I guess they just want to force people to buy new products, or go elsewhere. JerryLS: I like the duel trays so I don't have to shuffle different paper sizes. nmarwoo: If you wish to spend 3x as much on cartridges this is probably a great printer. I am choosing to shop elsewhere due to HP's restriction on third party cartridges. May not be a problem for others but I protest!